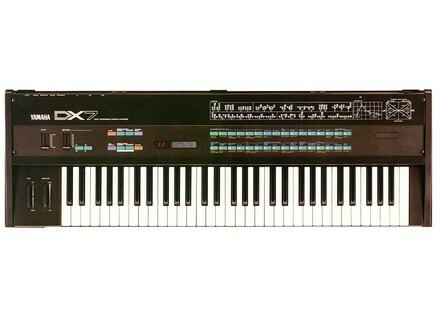 DX7, Digital Synth from Yamaha in the DX series. This digital synth will provide you with the sounds that you need to spark your creativity anytime you start working on a new song. I remember using this synth back in 08, and I used it for about a year and loved every minute of it. It has all of the connections you need to get it in line with the rest of your gear to bring audio and data back and forth. At the time I was using this with a drum machine by boss and was able to come up with some pretty good tunes. It will take some time to get use to just because it’s a different set up then most other digital synths. You will get the hang of it eventually and be well on your way with it. The manual was easy to understand as well, it wasn’t too thick of a book if I remember correctly and it was pretty too the point and not a lot of jibberish in it. Sounds where good, seemed to have a lot of vintage type synths from many years ago, but I can say that is exactly what I was looking for at the time so if you arent into those type of synths then I wouldn’t consider getting the Yamaha DX 7 because it will be useless to you with those old synths. But you do have the option to manipulate all the sounds and edit the parameters to how you want them which will affect the sounds that come out. Overall, great board and I remember having so much fun with it. I no longer have it but if I was to sit down with it today I still feel like I would know how to do everything. Its like riding a bike, you just don’t forget how to do it even if you get older. I may go out and get another one of these one day since they don’t cost that much and didn’t cost that much back then so I can only image what they are going for in todays music world. I will be on the look out for another one . 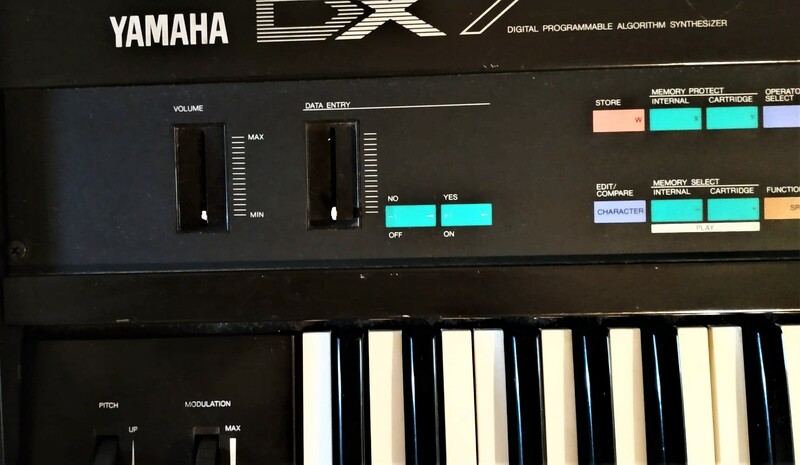 The Yamaha DX7 is a frequency modulation based digital synthesizer. The keyboard spans about four and a half octaves and has both pitch and modulation wheels. It has 1/4 inch outputs and it also has MIDI connections. In addition, this synth is fully polyphonic. The configuration of the Yamaha DX7 can definitely take some getting used to, as there are a lot of different things you can do with this. It both has preset sounds and has the ability to store your own sounds as well. It is easy to toggle between all types of sounds, but will take a little while to understand all the ins and outs of this keyboard. The manual for the Yamaha DX7 is pretty complete and is definitely good to have around while you are trying to learn this powerful instrument. The sounds on the Yamaha DX7 are pretty varied, but all have a similar recognizable sound about it. It definitely sounds like the time period in which it came from, which is the 1980s. It is great for dance and pop music, and if you want to get creative you can definitely use it for all types of instruments. The feel of the keyboard is nice and it is very easy to play. The pitch and modulation wheels, and other parameters provide for almost endless possible sounds with this keyboard. Overall, an extremely unique instrument that is a great tool for a wide variety of applications. I've been using the Yamaha DX7 synth for about three years and it is easy to see why it has become a classic. Surprisingly, these are pretty easy to find and aren't really that expensive. So if you are a fan of the sounds on this, it is a pretty easy pick up and is great to have around for both recording and live shows. Overall, the Yamaha DX7 is a unique instrument that definitely holds a place in the history of synthesizers. For being released in teh early 80s, this synth is by far and away one of the best of its era. Great sounds, but there are 10,000+ library files online to go through to find what you're looking for. I've had the best success in making or altering existing patches rather than using old ones. If you're doing 80s styled music, this is essential. THe interface is difficult to get used to. Programming this requires patience and the ability to read very thick manuals. It's all algorithm based, so fun with math. It's great for either overly digital sounds or pads. If you want to sound like Orbital, this is your synth. Sounds a bit nasally, but after running it through some standard effects, it sounds beautiful (eq, reverb). Does not have effects built in. I love my DX7. Don't take it away. Please. I love digital synths. I am an industrial musician in a project called SCAB, my name is wrat. I wouldn't use anything else! May be difficult for beginners, but I can slide across it. Nearly 20 years and hasn't failed me yet! I love programming these babies. If you have the first model they are 20 years old, that is pretty vintage baby. It will be as popular as analog someday. Once it fades.